The Vancouver Condo Buzz » EXCITEMENT BUILDS for MC2 Vancouver Condo Towers by Intracorp Located at Marine & Cambie > Preconstruction Vancouver MC2 Condos Start from < $260,000! « Best Value > From $159,900 at The Elliot Street New Westminster Condo High-Rise by Censorio Group > Cheap New West Elliot Condos for Sale! EXCITEMENT BUILDS for MC2 Vancouver Condo Towers by Intracorp Located at Marine & Cambie > Preconstruction Vancouver MC2 Condos Start from < $260,000! If you haven’t heard already, the new preconstruction Vancouver MC2 Condos are now previewing with sales starting NOW! Register today for more information. The building itself features architecture by James K.M. Cheng Architects Inc (see video posted) and the modern and sleek design is composed of durable concrete construction. In addition, there will be public art by Douglas Coupland and generous outdoor living spaces for all residents. The modern lobby will welcome you home and the homes will have expansive views of the North Shore mountains and even downtown Vancouver. The preconstruction MC2 Vancouver Condos for sale will also feature central amenities that include such things as a generously landscaped street scape with seating and common pocket parks and children’s play area, making the entire development very pet and family friendly. In addition the presale MC2 Vancouver Condos for sale will feature a reflection pond water feature with a stepping stone entry path way announcing the entrances to both of the towers at MC2 Vancouver real estate development. Also, the central amenities continue onto the concierge desks (one for each of the two high-rise towers) in addition to boutique style retail stores and an outdoor lounge area that you can enjoy. The MarinexCambie Vancouver MC2 Condos for sale will also introduce a pedestrian oriented Mews with inviting landscaping. The Vancouver MC2 South Tower will have roof top amenity spaces that include a clubhouse style lounge, fitness gym, zen garden, putting green, urban agricultural plots as well as a green house. The Vancouver MC2 North Tower will be home to a ground level fitness gym and meeting/business rooms. 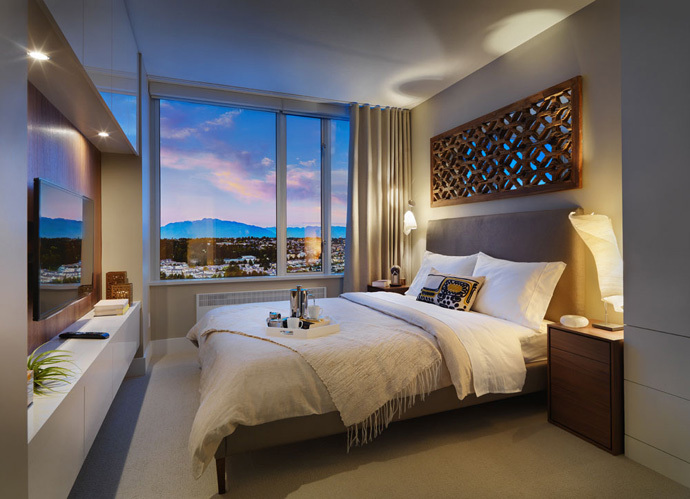 Both of the presales Vancouver MC2 Condo Towers will be designed to meet LEED Gold standards with energy efficient features including Euro style heating throughout the homes and Euro designed JAGA Briza passive cooling units in all bedrooms. Also, there is a GREEN podium deck on the North Tower at the Vancouver MC2 Condo High-Rise in addition to Energy Star rated appliances, low emitting materials, adhesives, paints and sealants. Other energy efficient standards at the new Vancouver MC2 Condos for sale include individual suite metering, motion sensor lighting and water efficient plumbing fixtures. The lobby and parkade of fob entry access with security cameras placed in the lobby, lounge and parkade. All of the Intracorp Vancouver MC2 Condos for sale will come with the Travelers Canada Home Warranty. The bathrooms at Vancouver’s MC2 condos by Intracorp are extremely high-end and will feature soaker tubs with integral skirts, natural stone porcelain tiled floors, elegant polished ceramic bath wall tiling to full height around the shower and tub as well as Grohe fixtures. Other bathroom features at the new Vancouver MC2 Condos by Intracorp include custom designed medicine cabinetry complete with vanity mirror, contemporary styled wall hung cabinets made in Italy by Armony Cucine, featuring solid, matte finishing with soft close Blum mechanism and stainless steel pulls. 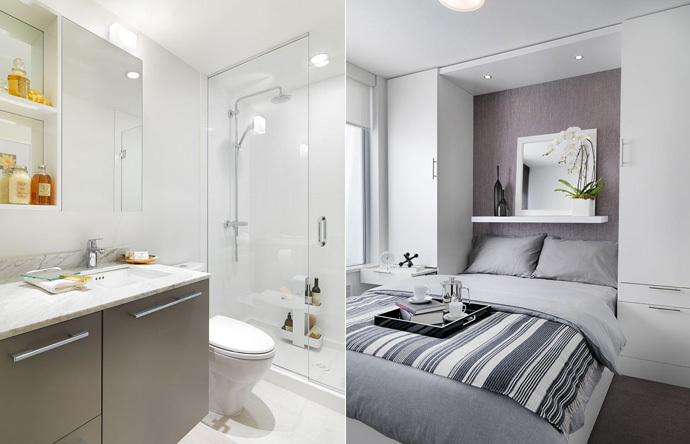 Other bath features at the Vancouver MC2 Condos include Toto dual flush water saving toilets, solid marble polished counters and under mounted sinks. All kitchens will come with a superior gourmet appliance package that includes Blomberg ultra quiet Energy Star multi-cycle dishwasher, Blomberg 9.9 cu ft Energy Star fridge/freezer unit, Blomberg 24” glass front 2.5 cu ft wall convection oven and a Blomberg 24” electric cook top in black with stainless steel trim with Faber built in hood fan. The electric cooktop has Touch Control. In addition, the MC2 Condos in Vancouver real estate market will include full height marble backsplashes, rolled steel shelf in kitchen along the backsplash and contemporary Armony Cucine high-end cabinetry with high gloss solid white lacquer for the upper cabinets and solid, matte finish lower cabinetry all with Blum soft closing mechanisms and stainless steel handles. All kitchens at the new MC2 Condos in Vancouver will feature solid Caesarstone counters, square 20” single bowl stainless steel sinks, Grohe faucet and under cabinetry puck/task lighting. This Vancouver condo project by Intracorp Developers will also feature two colour palettes including Cambie and Marine, designed by Trepp Design Inc. Also, the kitchen, entry, living and dining rooms at the MC2 Homes in Vancouver at CambiexMarine will include eco engineered laminate flooring as well as loop carpets in the bedrooms. There are flat slab insterior doors as well as wood baseboards and mouldings throughout the residences. The new Vancouver MC2 homes for sale will also have roller blinds, stacked Blomberg Energy Star washer and dryer as well as high-end Italian Armony Cucine White built in bedroom wardrobes and adjustable shelving units. Please note that all finishes in these homes are subject to change a the discretion of the builder. MC2 Vancouver Condos by Intracorp (aka CambiePlace) Set to Launch! The CambiePlace project is now renamed and officially launched as MC2 Vancouver condo towers! Presented by Intracorp MC2 Vancouver condominiums is the most exciting project to launch in 2012, and now is the time to register your interest for this master planned community by the top builder in the Greater Vancouver real estate market! Coming this Fall 2012, the pre-construction Vancouver MC2 Condos (or CambiePlace as they were originally called during the proposal stage) will feature two stunning LEED® GOLD designed glass towers by award winning James Cheng Architects. In addition to the landmark architecture at the CambiePlace MC2 Vancouver condo towers, residents will also enjoy an enviable central location along the Cambie corridor at Marine & Cambie Street. The 2 high-rise towers that make up the new pre-construction Vancouver MC2 Condos by Intracorp will release up to 443 homes to the market place and will offer breathtaking panoramic views in all directions, luxurious interior finishes as well as expansive outdoor living spaces. All of this available in one of the most sought after new locations in the Vancouver real estate market that is just next to the street from the Marine Drive Station on the Canada Line Skytrain route. Not enough can be said of its developer, Intracorp, that has one numerous awards for customer service, craftsmanship, architecture, interior design and building awards. The CambiePlace MC2 Vancouver condo towers will also be affordable for first time homebuyers, singles/couples, families, downsizers/upsizers as well as condominium investors. * Please note that the Intracorp Vancouver MC2 pricing and specifications are subject to change. This is not an offering for sale. E.& O.E. The MC2 Sales Team – Presentation centre coming soon. Visit www.mc2living.com today to pre-register your interest. Marine and Cambie Corridor > New Vancouver MC2 Condo Towers Launching! MC2 Vancouver High-Rise Towers – Coming Soon to Marine and Cambie! And wait until you hear about our INCREDIBLE PRICING. With MC2 Vancouver condo homes starting from just $259,000 and 230 pre-construction condominiums priced under $350,000 – owning at MC2 CambiePlace by Intracorp is a truly SMART DECISION. Your SMART DECISION is backed by a strong Vancouver real estate development team whose well-thought out plans will maximize space, light and livability. 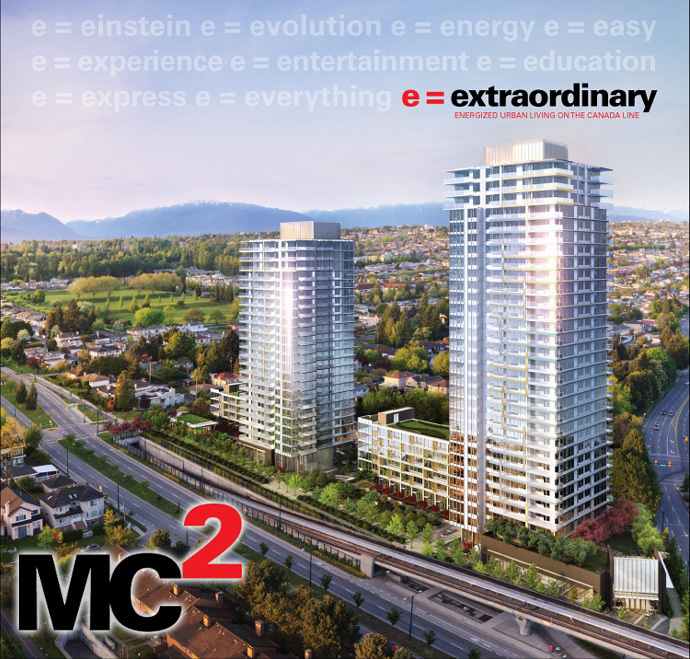 SEE MC2 VANCOUVER CONDOS ON SEPTEMBER 22nd. Register today online for priority access at www.mc2living.com or call 604.638.9998. Don’t miss out on this incredible opportunity! More Than Just a Theory, MC2 Vancouver Is This Year’s Hottest Condo Project! Simple, elegant, affordable, centrally located and highly anticipated. These are some ways to describe the new Vancouver MC2 Condo tower project located along the Canada Line at Marine and Cambie. Brought to you by world class developer Intracorp, MC2 Vancouver condos for sale are now about the change the city and the area for the better with an environmentally friendly, exceptionally designed, energetic outlook that will combine great elements of education, exercise and entertainment all within this master planned condominium community. The pre-construction Vancouver MC2 Condos by Intracorp is fast becoming the most highly anticipated and sought after project of 2012 and with James Cheng Architects designing the 2 towers and podium, this striking development will also become a landmark high-rise project. The finishes will also be exceptional, with Armony kitchens from Italy and lots of cooking/preparation and entertainment space inside. 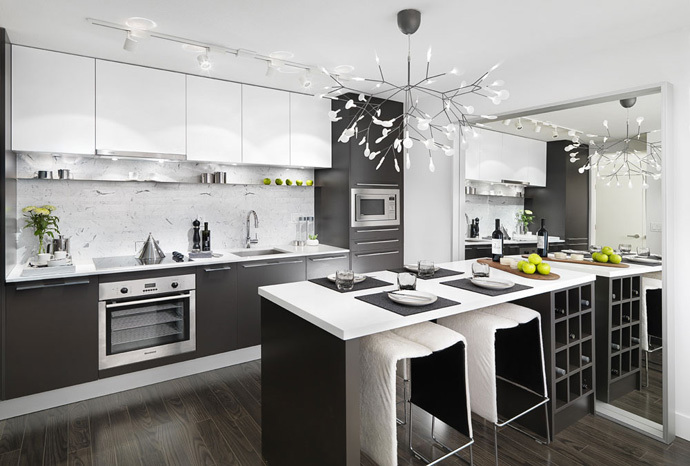 Blomberg appliances as well as that sleek and contemporary look will be standard in every home at the boutique Vancouver MC2 condos for sale. Also included in your new MC2 Vancouver condo are closet organizers, custom mill work, built in storage that is efficient and functional, roller blinds, state of the art cooling system and private outdoor spaces. The views are also spectacular from both towers, giving panoramas to the North Shore mountains, UBC, water and the Cambie Corridor. Located along the Skytrain Canada Line, the MC2 Vancouver preconstruction condos is a must see also for its location that is rapidly developing in a central corridor. Accessibility is the key here and with boutique stores, big box stores, international cuisine and shopping all within minutes from your new preconstruction Vancouver MC2 condo home, you won’t need a car. Also, there will be a VIP Cineplex, Vancouver’s first. 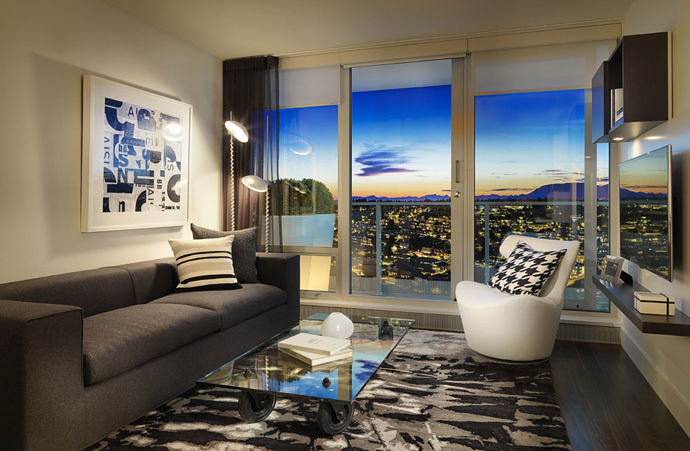 The preconstruction Vancouver MC2 condo price point starts from just $259,900!